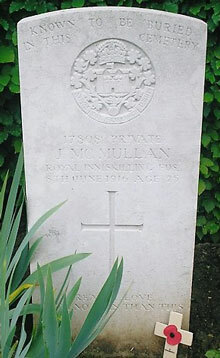 John McMullan was the son of James and Eliza McMullan. 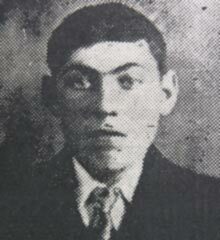 He was born in Ruskey, Coagh on 16th March 1889. He was one of eight children. They lived in Ruskey. His father was a farm labourer. John became an agricultural labourer. Private John McMullan was serving with the 9th Battalion of the Royal Inniskilling Fusiliers when he was killed in action on Monday 8th May 1916. He was killed in a heavy bombardment by the Germans after the Inniskillings had carried out a successful night raid on the German lines on 7th/8th May 1916.